7% on all other tangible personal property unless specifically exempted. Franchise Tax: .25% of the greater of net worth or real and tangible property in Tennessee. The minimum tax is $100. BNA serves 440 flights daily in more than 50 non stop markets. BNA is served by 14 airlines including international carriers Air Canada, WestJet, and British Airways; 3 cargo carriers, and 2 fixed-base operators. British Airways flies nonstop between Nashville and London Heathrow. Duck River Electric Membership Corp.
for 10, 30, or 60 mile radius of the Franklin County Industrial Park. 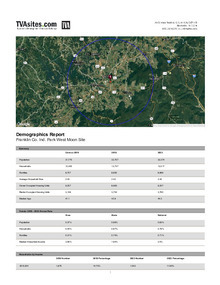 Download "10 Mile Demographics Report.pdf"
Download "30 Mile Demographics Report.pdf"
Download "60 Mile Demographics Report.pdf"